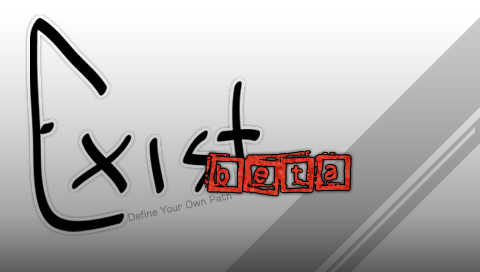 - EXIST � Define your own path. A:  Exist is a shell developed by Team Duck! That is based around massive user compatibility and user customization. Q:  What kind of user customization? and point them to whichever folder you would like, giving you an unlimited number of possibilities to customize how you view your files. '-list' shows them in the bootable format. Console. This all depends on how you want it to look and function. The main menu is set into 4 quadrants, Top Left (TL), Top Right (TR), Bottom Left (BL), and Bottom Right (BR). To change these images simply place a 144x81 '.png' image named to the corresponding quadrant in the designated folder. For Example: Place 'tl.png' in the 'E: /PSP/Exist/TL/' folder. As I said above in each of the quadrant folders there is a config.txt file, in which you specify which folder you wish to designate to that quadrant. In this designated folder, place your eboot's in separate folders, name them as the application they are. 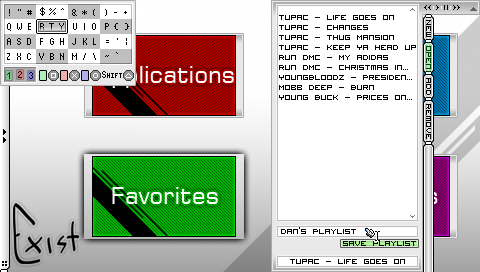 For Example: SNES for an SNES Emulator, PSPRadio for PSPRadio, as simple as that. The folder needs to be named this way because there is a setting in which you can list applications and text, and because not all eboot�s has the proper header names, this is the easiest way to guarantee that they are appropriately named. As you may have noticed the SC1-3 buttons on the UI Bar, they are also editable in the main config.txt file. These shortcuts can be set to eboot�s, ISO (Legal Backups), pictures (.jpg, .bmp, .gif, .png), music (.mp3, .ogg), or video (.pmp). Music Note- Turns on/off Player.